One of my most favorite places on earth is a Seattle seafood institution: Ivar’s. 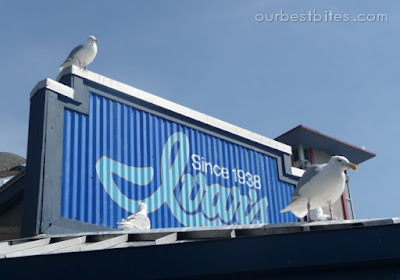 If you’ve ever been to Seattle you’ve probably been to Ivar’s, and if you ever make it to Seattle in the future, make sure to put it on your list of places to go! 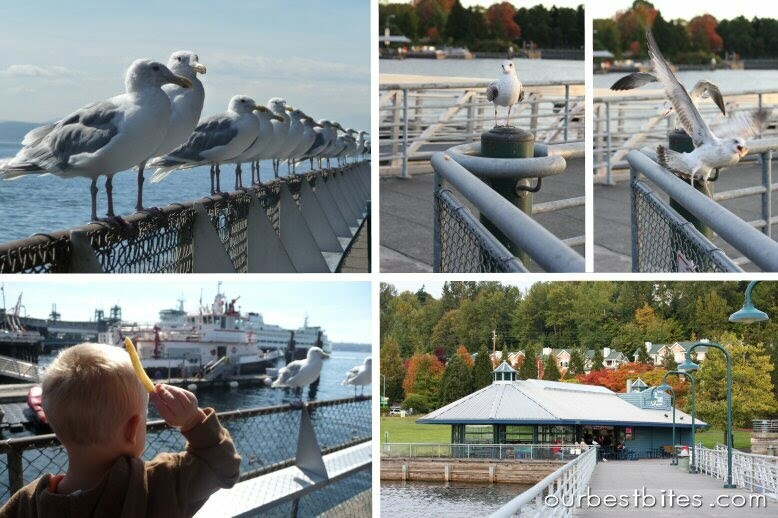 You’ll sit by the waterfront and be surrounded by seagulls who act more like friendly trained golden retrievers. They’ll catch fries thrown in the air, or just eat them right out of your hand. One of my favorite Ivar’s locations is actually south of downtown Seattle at Coulon Beach Park. I spent a lot of time there as a child and now I love taking my own kids there. Here’s something my family has always made fun of me for. Every time I go to Ivar’s I order the same thing- chicken strips and fries! 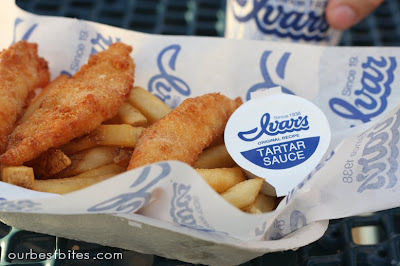 Don’t ask me why- but I love chicken strips with tartar sauce, and Ivar’s tartar sauce is so good. And the fries…. fries doused in vinegar and dipped in tartar sauce is one of life’s wonderful little pleasures. When I was kid though, I was all about the fish sticks, and I wanted to make some at home for my kids. I used a quick breading that involves both panko and normal bread crumbs and I kept them lightly seasoned so it wouldn’t be overwhelming when you slather them in tartar sauce. I could dip just about anything in this tartar sauce by the way- so easy to whip up and so good! 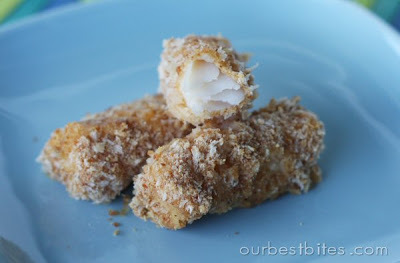 This is a great way to introduce fish to young kids since it’s similar to a chicken nugget. I actually explained to my boys that these were “chicken nuggets from the ocean dipped in pickle ranch” and it went over great! For the fish sticks start with a good, fresh white fish. I used cod, but halibut or talapia should work well too. Slice it into fish stick sized pieces. I didn’t realize that they would shrink up so much so mine ended up more like stubby nuggets, but hey, it works. 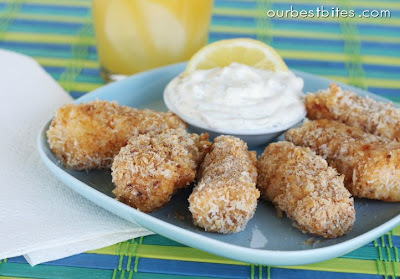 This is a similar process to my Crispy Coconut Chicken Fingers. Dredge each piece of fish in seasoned flour, then in beaten eggs, and then in a combo of bread crumbs and Panko. Place on an oiled baking sheet and bake them for only about 10 minutes- quick and easy! 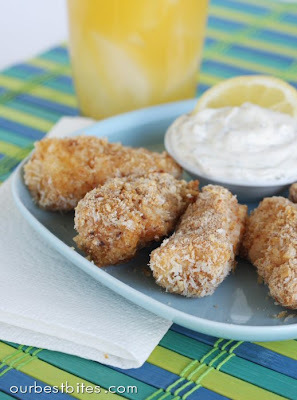 Let cool for a few minutes and serve with the yummy tartar sauce. 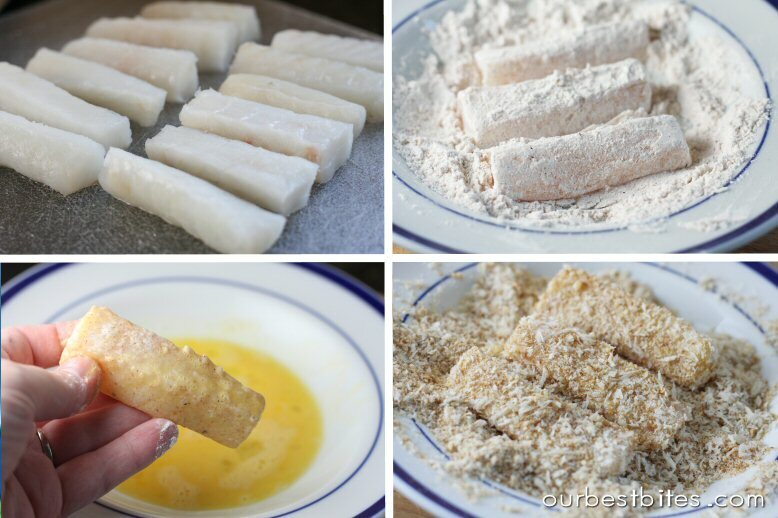 Fish Sticks: Preheat oven to 450 degrees. Brush canola oil on a rimmed baking sheet and set aside. Crack egg(s) into a shallow dish and beat lightly (start with one egg and crack another if you run out). In a separate shallow dish combine flour, seasoned salt, pepper, and paprika. In one more shallow dish combine panko and bread crumbs. Cut fish into sticks about 3-4 inches long and 1/2-1 inch tall. Working with a few pieces of fish at at time, dredge first in flour and then shake off excess. Then dip each piece in the beaten egg, and finally the bread crumb mixture. Make sure all sides are well coated with bread crumbs and then place fish on the baking sheet. When all pieces are on baking sheet, place in oven and cook for about 10 minutes. Cool for a few minutes and then serve with tartar sauce for dipping. Oh, this dish looks fantastic. Thank you for also posting a homemade version of tartar sauce!! These look great – can't wait to try it out – thanks for sharing! That's so funny Sara. I have lived about an hour from your parents house most of my life and have the same aversion to seafood. I can eat salmon or fish n chips if there is tarter sauce. I will have to give these a try as the rest of my family loves seafood. Hi, this looks delicious and very kid friendly. I was wondering if you could flash freeze these for future use and at what point in the preparation process. Would you freeze them up until you baked them or after you baked them? I live in Seattle and we love Ivar's! My favorite location is in the Wallingford/Fremont neighborhood right on the water and below the I5 bridge. There's a dock in back where you drive right up in your boat, tie it up, and then go inside to eat! HERE'S MY QUESTION: I can't use eggs for the breading step because of an egg sensitivity in our family. Would anything else work instead? Could I dip it in milk to adhere the bread crumbs? ooh, I've never been to the Freemont one- that sounds awesome! OMG Sara, you have no idea how much I hope this tartar sauce is a close second to Ivar's! For all the years I have been trapped in Michigan I have tried to haul all of my Seattle favorite foods home on the plane with me to G.R. I almost got thrown off my flight in Seatac for getting into a horrible argument with the TSA people over whether the four jars of Ivar's Tartar Sauce I had in my carry-on were some sort of "jellied bomb material". I of course, lost the argument and had to repack! Though I am moving back to my beloved Whidbey Island (and the land of Maple Bars) in September, I can't wait to try these recipes for the rest of the time I am remanded to the Midwest. THANK YOU!! "jellied bomb material" hahaha I love it Judibee! Give the recipe a try and let me know if you like it. I can't claim it to taste just like Ivar's, but it's pretty darn good! P.S. Sara– if you come up with an easy, do-able recipe for Maple Bars you will be my HERO FOR A LIFETIME!!! I think I might just try these out! My hubby will think I'm nuts, but they look so tasty right now! AND YEAH for Seattle natives! I live in the area still and love the fresh seafood options we have here. Can't beat it! Loved this entry! You just brought up memories of Maine for me. Love your fish sticks. I will take this recipe with me. Sara–your Aunt Barb is so proud of you…seafood! Mmmm…Ivar's! I was just recently home in the Seattle area and wasn't able to make it to our favorite location which also happens to be yours the Coulon Beach. My dad would dock the boat and we'd stop for lunch there. I'm going to make this recipe and hope that it curbs my craving for the insatiable taste of Ivar's. When you live in Arizona, you don't get much seafood – just a LOT of Mexican. I love your site. A friend sent me the link a few months ago and I have tried many of the recipes and have loved them. I don't make enough fish and I know that my family would eat it if I did. I think this is the perfect dish to start with! Thanks! Oh how I love Ivars!! These were delicious and easy. The breading takes a little time, but well worth the effort. Didn't make the tartar sauce, just served them with ketchup (for the kids) and homemade lemon-y mayo (for us). My three year old ate it up! Hallelujah! These were really good and definitely kid friendly! My three year old ate more than I did. Sarah, you really should do more fish. Its great! Mmm I'm going to have to try this! I'll bet the panko is great. I was eying the cod that's on sale at the grocery store this week and we haven't had fish in a little while. I'm from Seattle, too, but live in Alaska now where they also like seafood 🙂 When I was a kid, I liked different kinds of white fish and fried clams, but hated shrimp and scallops. I sure like them now though! The only one I dislike is oysters. Ew. When I was 5 I was fed a raw oyster without knowing that it was and it scarred me for life I think! 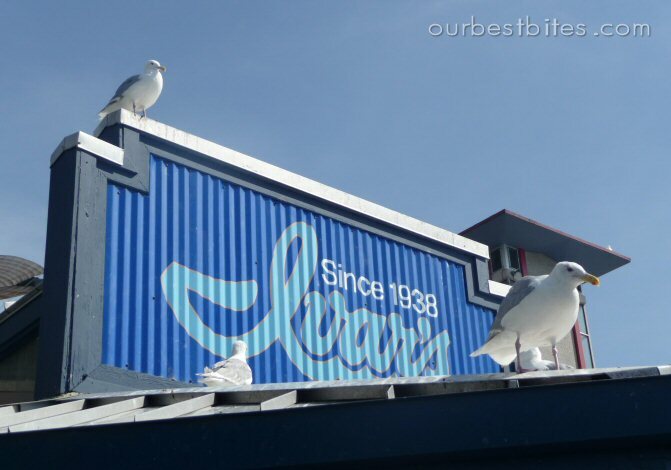 We love Ivar's too, my clam chowder loving Alaskan fiance thinks Ivar's makes the best clam chowder and fish and chips. I am so glad i came across this recipe! I’m going to make it tonight, and my hubby is really excited about the homemade tarter sauce. Thank YOu! We just got back from Alaska and I couldn’t wait to try our halibut we brought home. (Living in Idaho, we don’t really get alot fresh seafood haha)This was so good! My hubby and 2 year old loved them. I love the fact that they’re are baked, and the homemade tarter sauce was the candle on the cake. I’m so happy I discovered your website! This is the yummiest tartar sauce, our family loved it. And the fish turned out crispy and tasty without frying it in oil. This recipe is a keeper! Those pictures were taken right down the street from my house!! Small world! I would eat at Ivar’s daily if I could. I love your work…. and your food! I grew up in Seattle but live in the midwest now. I have many fond memories of throwing fries to the seagulls at Ivar’s and theirs was the only seafood I was willing to eat as a kid! (Although I think I probably ordered the chicken some as well.) I could have eaten the tartar sauce plain, too. Anyway I made these for my gluten free family (just subbed gluten free flour and breadcrumbs) using tilapia and ALL three of my kids AND my husband liked them. This is nearly unprecedented in meals. Not really a quick meal to fix, and kind of messy, but they were great. Thanks! And thanks for the Ivar’s memories.